For the first time since the Mount Royal University Cougars skated off SAIT’s ice with the ACAC Hockey Championship held high last April, the two teams will do battle twice on the Nov. 17 weekend. “It could be some of the best hockey in Calgary with SAIT and Mount Royal playing each other,” said Ken Babey, SAIT head coach. He’s not holding onto anything from last year, saying when you win, you need to enjoy it, but when you lose, you have to move on. This year, the two teams are evenly matched with Mount Royal only three points ahead of SAIT in the standings. And the two teams have the almost identical goals scored and goals allowed. Yet both coaches admit they are heading in blind, not having watched any games of the opposing squad. However, Cougars head coach Jean Laforest believes it’s just another week and believes it’s a good time to feel out the opponent for their next meeting scheduled in February. “You don’t put more emphasis, it’s just more energy because we are cross-town rivals,” he said. “That’s probably as far as it goes. 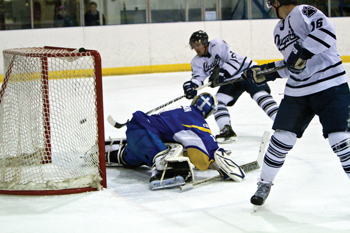 During last year’s ACAC championship, Mount Royal defeated SAIT 1-0 in the fifth and deciding game. However, it was later determined the Cougars used an ineligible back-up goaltender, despite an ACAC official giving them permission. Mount Royal officially won the game when a tribunal later sided with their appeal. “It won’t really affect much of this year because it’s a new year,” Babey said. Game time is 7 p.m. Friday at SAIT Arena, and 7:30 p.m. at the Flames Community Arena.